A stunning celebration and reappraisal of the importance of “women’s work,” Made from Scratch addresses the tug that many Americans feel between our professional and private lives. In this stunning celebration and reappraisal of the importance of "women's work," acclaimed journalist Jean Zimmerman poignantly addresses the tug that many Americans of the twenty-first century feel between our professional and private lives. With sharp wit and intelligence, she offers evidence that in the current domestic vacuum, we still long for a richer home life -- a paradox visible in the Martha Stewart phenomenon, in the continuing popularity of women's service magazines such as Better Homes and Gardens, Family Circle, and Ladies' Home Journal -- whose combined circulation of over 17 million is nearly twice the combined circulation of Time, Newsweek, and U.S. News &amp; World Report -- and the booming business of restorations, where onlookers get a hands-on view of domestic life as it flourished in past centuries. 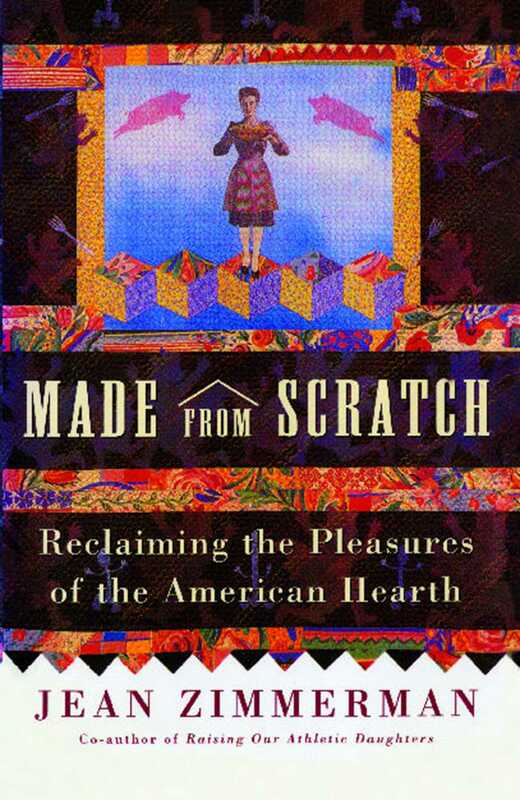 This book is about the ways home traditions passed from one generation to the next -- baking a birthday cake from scratch, cherishing family heirlooms, or discovering the satisfaction of piecing a quilt -- sustain our souls, especially in our ever more processed, synthetic world, where we buy "homemade" goods and fail to see the irony in that. Made from Scratch tells the story of the unsung heroines of the hearth, investigating the history of female domesticity and charting its cultural changes over centuries. Zimmerman traces the lives of her own family's homemakers -- from her tiny but indomitable grandmother, who managed a farm, strangled chickens with her bare hands, and sewed all the family clothing, to her mother, who rejected her country upbringing yet kept a fastidious suburban home where the gender divide stayed firmly in place, to her own experiences as a wife and mother weaned on the Women's Movement of the 1970s, with its emphatic view that housework was a dirty word and that the domestic sphere was to be fled rather than cherished. In this book Zimmerman questions the unexamined trade-off we have made in a shockingly brief time span, as we've "progressed" from home-raised chickens to frozen TV dinners to McNuggets from the food court at the mall. What is lost when we no longer engage, as individuals and as a community, in the ancient rituals of food, craft, and shelter? My grandmother, born in 1913, was the last of the old-fashioned American homemakers. A farm wife, she lived her whole life in small-town western Tennessee, midway between Memphis and Nashville, near the border of Kentucky. Her family was close-knit. My grandmother was raised next door to her own grandparents, catty-corner from the house in which her future husband grew up, and together my freshly married grandparents settled on that same block, first in the little house where my mother was born and then in a classic sprawling Victorian conveniently situated next door to my grandfather's first business, a filling station. Not a soft, big, maternal type, my grandmother was bird-small yet not breakable. She was fashionable, never dowdy. Yet despite her stature and her style, my grandmother embraced the heavy labor of farm life. My grandparents planted fields of feed corn and cotton, soybeans, and okra on farmland outside of town. At the farm, coarse-haired hogs rooted in a pen, and up a rutted muddy road grew a vast peach orchard. Summers, my mother and her sisters and brother helped the field hands harvest strawberries, hunching on their hands and knees over the easily damaged fruit. All of the picking was hard: fuzzy okra pricked the fingertips, and cotton sat like a boulder in the canvas bag slung over the shoulder. Standing sentry behind a big wooden table, my grandmother would count the slatted produce carriers as the pickers brought in each harvest. Hers was a country life, hard and simple, with one foot planted back in the nineteenth century. Even years later, sending my grandparents letters was easy: the only address required was their name and "Greenfield, Tennessee." You could add "Main Street" if you wanted to get fancy, but the information was unnecessary, a letter would get to them without it. When my mother called home after moving away, the town switchboard operator didn't need to hear her name to connect her with her parents' house. By 1920, the number of Americans living in cities for the first time outweighed those living in the country, down from 95 percent of Americans who lived in farm country in 1776. A wood stove or a spinning wheel had disappeared from almost every American household, and nearly every home had electricity. In rural Tennessee, though, some things that defined the labor of women like my grandmother hadn't changed. Up through the 1940s she kept a horse and a milk cow in the yard under the catalpas and churned butter in a big ceramic crock on the back porch. Apple and damson trees supplied fruit both for eating fresh and for putting up. The family lived a few blocks from the grocery store, but fresh meat wasn't something you bought. In fall a pig from the pen would be slaughtered for its lard and to send to the barbecue pit. My grandmother's job included wringing the neck of the chicken for every platter of fried chicken she put on the table. My grandmother sewed all the clothes for her children, selecting fabric at E. and J. Brock, the old general store that sold yard goods. Sometimes she would create matching outfits for herself and all three daughters. Walking to town on a Saturday night as teenagers, the girls would model their homemade dresses, stepping across the railroad tracks that sliced through town under the water tower with GREENFIELD in giant block letters on its side. A woman named Elrina lived with her husband in a small wooden shack in the corner of the back lot behind the house, and she helped out in the kitchen. Mostly, though, my grandmother herself dished up the stewed tomatoes, chicken-fried steak smothered in milk gravy, black-eyed peas, collard greens, and dinner rolls. This was food that was made from scratch, homegrown and in some cases hunted down. One Thanksgiving when I was a child, my grandmother roasted a wild turkey that my grandfather had killed and my mother cracked a tooth on a pellet of buckshot. Opening the refrigerator to find a cold drink on a summer afternoon, I discovered skinned squirrels in Tupperware and was told that Grandpa shot them out of the trees in the backyard. Through the 1950s and 1960s, as the world around them convulsed with social changes, my grandparents still lived close to the land. Something seemingly eternal, never changing, was the shared assumption that care of the home was a woman's responsibility as well as a source of accomplishment that deserved respect. My grandmother inherited the mantle of homemaker from her own mother and her mother's mother. I spent afternoons at the house of my great-grandmother, where we drank grape soda and watched Art Linklater on the black-and-white TV. We took a photograph the summer I turned twelve that we called "the four generations": my great-grandmother, grandmother, mother, and myself. The dress I wore, my favorite dress, had strips of lace, factory-made lace, crossed on the moss green front like the ribbon on a present. I didn't know then that Granny herself was a lace maker, that her house was where the real needlework took place, where she spun intricate webs of polished-cotton thread. I knew Granny in her nineties, with a head of old-timey white pin curls and crepey white arms. I didn't know the richness of the craft life she'd led. The exquisite work that came from her hands was already antiquated, not worthy of mention. The places don't exist anymore, but the material objects that inhabited them are touchstones of my memory that help define an ideal of home: the orderly, shady house of my grandmother with its Dresden figurines and porch glider, its frigid metal drinking cups with drops of condensation down their sides, the crochet hooks of ivory and aluminum and a skein of plain brown wool, the pecan shells crackling underfoot out front. I can smell the tomato vines in the back garden, picture the speedy flight of purple martins at the towering birdhouse my grandfather built, hear the warble of the quails the neighbors kept in a chicken wire hutch. In my own attic now, a dusty cardboard box still shelters some of the most stunning relics of my family's domestic history -- the dozens of linens elaborately handworked by my grandmother and my great aunt, my great-grandmother, and her mother before her. My mother hastened away at age 17 from the swollen heat, the mute burgeoning physicality of small-town Southern life. She had never worn a store-bought dress until she went to college. Now she eagerly created a new identity for herself that would not include home-sewn clothes, hand-picked strawberries, or chickens whose necks were wrung in the backyard. At an East Coast women's college she studied art history and then married an Ivy Leaguer, the prototypical man in the gray flannel suit who commuted every day to a Manhattan advertising firm. At home in our one-step-down-from-Cheever suburb, my mother hosted cocktail parties and traded PTA responsibilities with other women, but most of her time was spent as was her mother's before her -- buying, preparing, and serving food, cleaning her house and keeping up her property, and attending to the clothing and other needs of her family. With all her smarts and sophistication, in these responsibilities she hadn't come all that far from the lives of her foremothers. Still, though her daily routine wasn't exactly what she had planned in her studious college days, she saw it as an improvement upon the backwater housewife's role she had escaped. She knew she didn't want a farm life. She had watched her mother and her aunt and grandmother sew, and thought it way too laborious, not to mention dull -- all those finishing seams you had to learn, when you could be reading instead. My mother came from the postwar generation of suburban housewives that Friedan described so well. These highly educated, increasingly frustrated women understood from intense personal experience that change was needed -- indeed, that it was already under way. Economic forces were pushing women into the workplace, and the women's movement was providing the political underpinnings for the push. Housewives, however, harbored the piercing fear that as the world around them moved ahead, they might be left behind, stranded between the domestic assumptions of the past and the unknown ways of the future. Women who gave birth to the baby boom generation may have wanted no part of the traditional life of the home, the life lived by women like my grandmother, and yet many of them performed its day-to-day labors to a tee in studied replication of the past, with the anodyne in many cases of Valium or vodka. My own mother, with her ikebana and spotless carpets, obsessing over the cleanliness of our Formica countertops, was likewise trapped (in the unshakable opinion of her adolescent daughter). She had the distaste for home-sewn clothes that comes naturally to anyone who has grown up wearing nothing else. Nonetheless, she was perfectly capable of hemming my school jumpers, her mouth bristling with pins. She maintained a well-ordered sewing box and recognized the importance of darning a sock, positions I gradually came to consider quaintly anachronistic if not downright pathetic. My family endorsed the recognized hierarchies of the day. My father had the "real" job that took him out of the home. His kitchen skills were limited to boiling an egg and making toast. My mother put dinner on the table for a family of five every day for over twenty years, which effort was within my family certainly not considered a "job" at all but a rote accomplishment, given no more notice than the weather. Good homemade spaghetti sauce and beef-barley soup emerged from my mother's kitchen, and even fudge tunnel cakes and carrot cakes when baking them was fashionable in our community. Her goal, though, was to escape enslavement by a hot stove. She didn't go out of her way to tutor me in the kitchen only because she didn't want me to get stuck there, the way some women will say they refused to learn to type because they never wanted to become secretaries. My mother rejected the farm life of her mother and of all the small-town matrons who predated her. Yet she wasn't ready to abandon the home. Dust free and immaculate, our house was my mother's clear domain. Though she hired cleaning help when she could afford to, its care was still undeniably her responsibility, and her pride. As I watched, growing up, my mother tried to cobble together the abyss between the past and the future. Attempting to make sense of her experience, I shaped an apocryphal theory that went like this. Yes, she kept a beautiful home. In so doing, she transferred her intelligence and taste from a possible professional career to the so much more mundane reality of creating a domestic life. This was really a tale of wasted talent, unnecessary "sacrifice." The story's message was simple and oddly like my mother's before me: I must get out. What has made it possible for the home to be an arena of caring, as in my house growing up, is, of course, the labor of women. In the women's studies courses offered in college in the late 1970s, when I was in school, we learned that women had been "inculcated" to be homemakers and to produce that labor, and that this was a bad thing. At Barnard, our texts were Tillie Olsen and The Feminine Mystique; going back further, we read Charlotte Perkins Gilman's The Yellow Wallpaper, the nineteenth century novella about a woman driven to despair and madness by her imprisonment in a domestic role. I soaked up Simone de Beauvoir's argument that women's lives, with their mindless daily chores, did not provide for the kind of daring and adventurousness necessary for exploring and creating important innovations in the world. Her stance on homemaking was adamant: "We have seen what poetic veils are thrown over her monotonous burdens of housekeeping and maternity: in exchange for her liberty she has received the false treasure of her 'femininity.'" The women's movement of the 1970s cleaved the world of work into two parts. One part, the public part, the "male" part, was deemed vital, engaging, and valuable. The other part, the part left behind in the house dust, the work of the home, was meaningless, humdrum, the stuff of subservience. The division of labor between women and men, I came to believe, was inherently unfair. This translated into a devaluation of women's prescribed jobs along with the mandate that women were supposed to get out of the house and plunder a piece of what in the past had been almost exclusively a male domain. Entering the workplace in the early 1980s, I felt the powerful cultural tug of this idea, being employed, as I was, at a nonprofit think tank devoted to helping women climb the corporate ladder. That men should likewise venture into the domestic world was only vaguely endorsed and articulated, centering on the demand that they do their fair share of the dishes. In 1983, when I was in my mid twenties, Esquire published a feature extolling the "vanishing American housewife," picturing an example of that endangered species on her knees, smiling brightly, cleaning a toilet bowl. I remember feeling that only an idiot (or a sexist pig) would believe that women were doing something important in the home. Home was a place from which women were to be liberated. The academic style of feminism that nurtured my generation -- the baby boomers who are now pushing Maclaren double-strollers through supermarket aisles -- did not celebrate the home or the homemaker and did not furnish the theoretical tools for us to grapple with our new roles. That women are drawn to traditional modes of parenting is documented in a recent Yankelovich poll that found 87 percent of women believe women are still the main family nurturers, even in two-paycheck families. Not only that, a majority of women, whether working or not, wish they were better parents. We are, many of us, still left high and dry by our political education. We are torn in a way that is not only theoretical but intensely personal. At the same time that female public achievers earn accolades, many educated and hardworking professional women are unsure they don't long for a life that more closely approximates that of their homemaker mothers. "Having it all" seems to have been a pipe dream. According to a poll conducted in 2000 for Lifetime Television and the Center for Policy Alternatives, 59 percent of women with children under six said they were finding it harder to balance the demands of work and family than they did four years before, and 30 percent said it was "much harder." My own inner maelstrom centered for a time on the view out my window of my across-the-street neighbor. The mother of three children under the age of seven, she had temporarily forsaken her career as a psychiatric social worker to raise her kids while her husband, a patent lawyer, worked hours that took him away from home from 7 to 7 every day as well as out of town on frequent business trips. Sitting at my desk, in front of my computer, I watched her unload her groceries from her car in midmorning, two-year-old in tow, and was surprised by the sharp sense of envy I felt. She did the "mindless" chores I'd once been convinced to despise -- put in her petunias on a cool spring afternoon, or sit on the swing in the backyard as her kids raced around her when school let out. A milk-and-cookies mom, my friend was famous locally for her skill at creating elaborate sugar cookies for holidays, birthdays, block parties, and Super Bowl parties. Here was I, adhering to my professional "career path," spending days trying to produce rather than maintain, mornings at my desk rather than in the sale aisle at Stew Leonard's. Much as I told myself that my friend could choose her path and I could choose mine, I coveted her nest and the license she took to tend that nest. My jealousy peaked one Indian summer weekday. I watched my perfect neighbor out on the grass, painting a cardboard packing container with red and white stripes to make a popcorn box Halloween costume for her eldest daughter. She stood in the delicious sunshine, performing her labor of love well in advance of the holiday, when I'd likely be scrounging at the last minute for wigs and makeup for my own daughter's costume. What most ate at me was that she had the time and peace of mind to create something memorable, by hand, that would be appreciated by her family -- that might even become a perishable but nonetheless important "heirloom," to be reused as costume or fort or any number of other objects as her kids grew up. Bland assurances about "balancing" home and work don't provide much solace in day-to-day situations like this. It sounds almost foolish today to admire a woman like my neighbor for this kind of effort. Even now, when there is an academic thrust toward teaching the contribution of women to American history, our inclination is to showcase the women who have achieved in the public sphere. We canonize the rare woman scientist or politician of the past or we pay tribute to those women who ventured out courageously to fight for the right to vote. We herald the Second World War's Rosie the Riveter for performing the gritty jobs soldiers left behind. This is all well and good. Little mention is made, however, of the work that ordinary women have always performed in the home, around and about the paid work they've done intermittently -- unless you take into account the appreciation of right-wing zealots, who glorify homemakers as long as they remain properly subservient to head-of-household men. If many of us didn't respect our mothers for the worth of their domestic labor, it stands to reason we might lack respect for our sisters who choose to be what is now called a "full-time mom." Women who don't work outside the home often complain that people they meet at social events treat them as if they are invisible. It's discomfort with homemaking that causes the phenomenon: we can't accept that the labor of the home remains vital, even in the twenty-first century. As a culture, today, we have devalued the work of the home, denied that it was work that ever mattered, and believed erroneously that willing it into nonexistence was possible and that women could take on jobs, whether full-time or part-time, and somehow still get it all done. If you add up all the hours, though, as economist Juliet Schorr does in The Overworked American, you see just how many more hours women are putting in than men between housework and paid work. It's particularly distressing to see women dismiss the domestic arts as unimportant. Hunter College psychologist Virginia Valian has investigated the phenomenon of women's subtle bias against the achievements of women. "In almost every study I've reviewed," she states, "it's not only men who undervalue women. Women also do it." The denigration of the homemaker's role, then, may reflect the internalized sexism that some women have developed under a continual barrage of negativity, prejudice, and discrimination. Because the work of the home has been deemed insignificant, we've been able, over the past fifty years, to walk away from it with an alacrity that's breathtaking. What is remarkable is how completely we've stripped ourselves of the skills, rituals, and allegiances that have sustained humankind since time immemorial. An age-old female craft tradition is threatened with extinction. Stitching a hem, making pie crust from memory, and countless other "quaint" and "trivial" domestic arts have now largely vanished from the cultural vocabulary. We've "disappeared" them. When we haven't abandoned them altogether, we've commodified them by giving them over to the marketplace, hobbified them in the manner of holiday craft kits, or celebrated their anachronism in "living history" exhibits. The domestic arts involved, which were centuries, sometimes millennia, in the making, are now undergoing their most substantial transformation ever. Yet we can't seem to walk away from domesticity and feel sanguine about it. Americans' ambivalence toward homemaking and homemakers is captured perfectly in the public's love-hate response to the phenomenon of Martha Stewart. In the early 1980s, when Stewart was simply a successful food professional rather than a lightning rod for domestic angst, I attended a reception she catered. Her knitting-needle-thin steamed asparagus and other veggies spilling out of a boulder-sized hollow bread loaf were the talk of the hors d'oeuvres table, since at the time crudités were still a novelty. Martha was a sprite, dancing around and through her catering staff serfs. Not everyone liked her, but it didn't occur to anyone not to respect her. Since then, she's been dubbed the doyenne of domesticity, but she's equally domesticity's demon. In her magazine, books, products, and television appearances, Stewart perpetuates an ideal of home that many Americans feel is unattainable, an expectation of homemaking people fear is unachievable. She represents all that we want to shove under the carpet or that we wonder whether we're ready to relinquish. She provokes every uncomfortable conflict we feel about home. I listened over dinner as a group of my peers ridiculed Stewart's recommendations on organizing a linen closet by labeling the shelves to match beds and sheet sets. "In my household, we never even fold our sheets!" said one woman. "Who has time? We just throw them on the shelf. Who does she think she is?" Critics charge that the problem with Stewart is her hypocrisy, that she's too rich to have to mash her own potatoes, and that assessment may have some validity. America has idolized domestic poseurs before, however. In the 1920s, a company known as Washburn, Crosby and Company, which would eventually become General Mills, looking for a way to promote its then-unpopular bleached wheat flour, created a fictional ace homemaker named Betty Crocker. For years, the woman who performed this part responded to mail, published cookbooks, and hosted radio shows to which she would invite Hollywood stars to share culinary tips. That act never fazed anyone, but today a businesswoman representing domestic ideals is a painful rock of Fleur de Sel in the wound of our discomfort over our own domesticity or lack thereof. The most venomous anti-Martha sentiment comes not from the elders or the youngers, who feel less conflict over how they approach keeping house. They're glad to get a good holiday gift-wrapping tip or lemonade recipe when they can. Instead, the noisiest Martha-bashers are the baby boomers, the cohort that's insecure, needled by unspoken doubt over whether hanging gingham curtains we've sewn by hand is a worthy investment of the precious few moments of free time we've managed to scrounge. (The average reader age of Martha Stewart Living is forty-one, while the average age of the e-customers for Martha by Mail online skews even younger, at thirty.) Easier to conclude domesticity's overrated and Martha's a dimwit or a dupe, and be done with it. The self-doubt lingers, though: That was the world we left behind, didn't we? We were supposed to escape the home, weren't we? All that's not valuable, anyway. Is it? The reality is that Stewart's franchise has shored up crafts that would otherwise be a lot closer to extinction, and offered a vision for a contemporary domestic way of life. She articulated this aspect of her business on a segment of Charlie Rose after the multimillion- dollar initial public stock offering of her company in 1999: "I was serving a desire -- not only mine, but every homemaker's desire -- to elevate that job of homemaker. It was floundering, I think. And we all wanted to escape it, to get out of the house, to get that high-paying job and pay somebody else to do everything that we didn't think was really worthy of our attention. And all of a sudden I realized: It was terribly worthy of our attention." It is time to honor and preserve the achievements of the women of the past, our female elders, grandmothers, great-grandmothers, the "Aunties of high repute," to use Harriet Beecher Stowe's beautiful phrase, the repositories of our collective wisdom. To do this, we must break through a cultural silence about homemaking and its value for everyone, including feminists, even today. It is time to celebrate the labor of those people, mainly women but sometimes men as well, who performed these jobs of caring over the centuries, and also to assert the dignity of those who continue in those labors today. This includes unraveling the tangle of guilt we in the baby boom generation feel over performing these tasks, or not performing them, or sharing them with the men in our lives. I believe revaluing "women's work" is a feminist act. We need to find a way to celebrate the "vanishing housewife" without echoing the patronizing tone of the Esquire feature of the 1980s. There is a reason beyond their monetary value that we pass heirlooms from one generation to the next. Families save the handcrafted products of their ancestors, along with the humble mass-produced objects (tables, chairs, chests, saucers, and plates) that evoke their day-to-day lives rather than the worldly accomplishments that might appear in an obituary. Endowed with the power to cross the barrier of death, family artifacts speak over a bridge from a distant time, different in so many ways, to the present, and to unite the two in a way that can't be measured or duplicated. Robert Frost calls home "something you somehow haven't to deserve," a birthright, a gift, a thing with which we all (or almost all) come equipped. Because it is of ourselves, it is the place where we can most be ourselves. The Latin lares and penates are beneficent household gods but they have also come to refer to household goods, the treasured possessions of the home, as if divinity resides in the very chairs and rugs and tables with which we surround ourselves. I know this to be true, since my family eats at the same table around which my great-grandparents took their supper as newlyweds, and I find meaning in that at virtually every meal. John Steinbeck describes the power of even the humblest family heirlooms in The Grapes of Wrath as the women of the Joad family struggle to decide which of their few belongings will fit on their encumbered wagon. ...the women sat among the doomed things, turning them over and looking past them and back. "This book, my father had it. He liked a book. Pilgrim's Progress. Used to read it. Got his name in it, right here. Why, here's his pipe -- it still smells rank. And this picture -- an angel. I looked at it before the first three children came -- didn't seem to do much good. Think we could get this china dog in? Aunt Sadie brought it from the St. Louis Fair. See -- it says right on it. No, I guess we can't take that. Here's a letter my brother wrote the day before he died. Here's an old-time hat. These feathers -- I never got to use them. No, there isn't room....How can we live without our lives? How will we know it's us without our past?" The most beloved objects with which we surround ourselves are unfailingly domestic. When my maternal grandmother's belongings were dispersed among my extended family, I was given some good furniture, along with mundane items, such as my grandmother's circa-1970s microwave. Perhaps the greatest treasure I inherited is a vintage, curved-glass breakfront that my grandparents purchased when it was already an antique and that holds a series of objects that are talismans of my family history. Monetarily, an appraiser reported, these items have little worth, as most are chipped, mismatched, or simply not interesting to collectors. Yet these objects possess immeasurable power. On the lowest shelf is a broad china plate painted with pink roses and lilies of the valley on which my great-great-grandmother served cake. Above stands my great-grandmother's cut glass perfume bottle, along with six thumb's-height "fancy" chocolate cups and saucers, in pastels and gilt, that my great aunt won at a party. My grandparents' childhoods are represented, my grandfather's by his childhood marbles, rough and opaque, in a faded green cotton sack tied with common kitchen string, and my grandmother's by her tiny, tarnished silver baby cup. The breakfront stands in my bedroom, and these are the last things I see before falling asleep and the first upon waking each day. They are the sentinels of my past. Equally remarkable are the stored handworked linens beneath my attic eaves. My great aunt, who produced much of this work, taught me to crochet when I was in grade school, and I held her in awe. Even as, growing up, I questioned the domesticity of my mother and the mothers of my friends, I had intimations that there were strengths inherent in the role of the homemaker, having spent summers in Tennessee with Auntie, who was a high school home economics teacher. Because she was a strong person, and because I watched her teach home economics as a science, in a cavernous lecture hall filled with long slate-topped lab tables, I suspected at some level that the work of the home could be a rigorous and respectable endeavor. The sheer longevity of the textiles impresses me, as does the knowledge that these items signify my family's past. Historical restorations have become our national curio cabinets. From the isolated cottage maintained by the Daughters of the American Revolution they have evolved in the past half century into an institution that educates and entertains and a major destination along the family tourism trail. Visiting historic sites provides us with an infusion of the tradition we rarely possess today in our own homes, packaged in such a way that we can step in and step out without losing more than a beat in the breakneck pace at which we live. We can stop at the 7-Eleven to buy a Big Gulp and a microwaved hoagie on the way to observe open-hearth cooking techniques demonstrated by docents required to wear contact lenses because their eyeglasses would wreck the illusion of historical accuracy. One popular historic site is the home of Washington Irving in Sleepy Hollow, New York, a rustic little cottage he called Sunnyside, with impossibly simple, charming rooms. His "snuggery" was as self-consciously constructed a home as a dwelling could be, improved upon continuously by this extremely sophisticated writer over the course of decades. Irving built Sunnyside to last. The imported tendrils of English climbing wisteria he planted at its stucco entrance load it down today practically to buckling, but 200 years after the vine took root it still thrives. When the railroad came through, cutting between his house and the Hudson River, Irving fumed -- it ruined his bucolic vision of home. Today, when highways pierce many a historic property, a train seems quaint, but the contrast between past and present grates more harshly than ever. At Williamsburg, interpreters try to pull visitors into the reality of a different time. Among the crowds in line for a lunch table at one of the site's tavern-restaurants, a bewigged, powdered, yellow-crinolined tavern keeper cruised the waiting families. "Are you learning housewifery?" she demanded of a ten-year-old girl with braids and a blue satin bomber jacket that read "West Virginia -- Dance-Tap-Jazz." Eyes cast down, the quintessentially twenty-first century child shyly replied that, well, her mother was teaching her to cross-stitch and how to make her bed. One of Williamsburg's most popular buildings is the Powell House, where schoolchildren participate in cookery at an open hearth or engage in other activities that would have transpired in the large, airy kitchen (though in summer, a Powell House cook-interpreter confided, the room gets uncomfortably toasty, over 150 degrees when the fire is blazing, just as it would have in the olden days). Kids accustomed to the digital manipulation of GameBoys relish pulling the seeds from cotton bolls or kneading bread dough. That a charred, spit-roasted ram's head -- a gourmet colonial entrée -- graces the middle of the table elegantly set for supper fazes them only a little. Yet time travelers draw the line at too much reality. The fiery heat and the ram's head represent the limit past which this historic site's domestic "reality" cannot go. "We heard from our visitors constantly that they want to believe they are in the eighteenth century," says Laura Martinsen, a manager in the restoration's School Groups Services Department. "Which kind of makes us chuckle, because if we handed you a chamber pot and said, 'Wash that,' it would become a little too realistic for people. Sorry, we can't treat that ear infection. Hope you heal, but you might die. To some extent, people want a romanticized version." Thus, although the interpreters who do the food preparation for the site also slaughter the animals raised on-site for cooking, they now perform the task behind the scenes. A few years back, a couple wandering the tidy, picturesque eighteenth century streets with their children stumbled upon a hog butchering on the lawn behind one of the taverns, and they didn't stick around for a discussion of how small fry in the olden days clamored for the pig's bladder, which served as an old-fashioned balloon. They filed a complaint asserting that their children were harmed by what they saw. "These days people will bring a lawsuit over anything," the Powell House interpreter told me. Now food historians demonstrate salting, lard rendering, and fresh pork cooking in a sanitized program called Hog to Ham, where the activities start after the hog has already become meat. Plimoth Plantation, the living history museum in Plymouth, Massachusetts, has always placed a premium on creating "reality," warts and all. The site is up the hill from Plymouth harbor, away from the Styrofoam-packed lobster dinners served on its weathered wharf, away from the schoolteachers and students in a gaggle around the chip of Plymouth Rock that still remains after the plundering of centuries of tourists ("its very dust is shared as a relic," in the words of de Toqueville), up from the Plymouth Wax Museum with its faded dioramas and cheap weather effects, and conceptual light years from the cinnamon potpourri and engraved souvenir teaspoons displayed at the John Alden Gift Shoppe. At Plimoth Plantation, an obsession with authenticity borders on the neurotic, if only because the choice of what to enshrine sometimes appears arbitrary. From its inception in the mid-1960s, the living museum site has been cited for its refreshingly gritty -- dirty, in actuality -- presentation of the past. One historian wrote approvingly about the first years of the site that unlike other restorations, the staff at Plimoth "did not wear the black clothing often associated with our pilgrim ancestors. Women...who slaved over an open hearth, or men who labored in the fields, were not pristine at the end of the day. Rather, they looked, smelled and felt like they had been working hard." Salaried historical interpreters inhabit their roles for the entirety of the warm-weather season, arriving at their replica stone homes in the Pilgrim Village at dawn to take their spots before the hordes arrive. The staff -- the Buckingham Guards of pilgrim history -- don't break character, much as children try to get them to. John Alden is John Alden, not a college student on his way to the beach and a beer after working hours. The women of Plimoth cook the family pottage over the sooty, stuffy hearths even in the blazing high noon of summer. Management encourages interpreters to eat what they cook. The blackened eel I saw on the sideboard in one house was someone's unfinished supper. As alien from our time and habits as some of the site appears, visitors find ways to identify with seventeenth century life. I listened to one tourist in shorts and sunglasses at the door of a rough-hewn pilgrim house sound out an aproned, bonneted interpreter on the cultivation of rosemary -- "I've had so much trouble getting it to winter over in my perennial border back at home!" -- and get some concrete advice, gardening tips transmitted from one century to another. Philosopher John Locke said that children will retain more if they play themselves into learning. The people who run Plimoth Plantation try to make the place not only authentic but broadly appealing, offering children's birthday parties at which guests can dress like a pilgrim and play seventeenth century games. Many historic sites make efforts to teach children the ways of the past, but spanning the distance between centuries can be a challenge. At one eighteenth century farm restoration in my area, I heard a frustrated-sounding interpreter try to knock some sense of reality into a crowd of suburban elementary schoolchildren distracted by the highly exotic stench and flies of a working barnyard. "Leather is the skin of all these animals!" he yelled as they raced around holding their noses and swatting the backs of the free-ranging sheep. To many of these kids, leather simply materializes as shoes or belts or the seats of cars, and to discover otherwise constitutes a minor revelation. An extensive foodways program at Plimoth invites adult visitors to dine on specialties re-created from period diaries and receipts by a skilled kitchen staff under the guidance of a culinary historian who explains each course as it is served. At one springtime lunch I attended, two dozen people delightedly chowed down on some rather tough brown bread, asparagus with orange sauce, a green "sallet," a fricassee of fish, and a roasted turkey. It struck me that living history is one of the few popular leisure activities that inherently honor the daily domestic labor -- the cookery, sewing, household chores, and gardening -- of the past. This dining table and the dusty streets outside harbored the last remaining evidence of our longstanding homeways, protecting them from the encroachment of the present, preserving the old ways as aboriginal tribes have found a way to preserve their culture by going ever deeper into the rain forest. The everyday is presumed here to be worthy of careful maintenance -- and precious vacation time. Americans' taste for historical restorations can be located to a large degree in their dissatisfaction with the current culture of domesticity. Writer Wytold Rybzynski maintains that, "Their nostalgia is not the result of an interest in archaeology, like some Victorian revivals, nor of a sympathy for a particular period, like Jeffersonian classicism. Nor is it a rejection of technology. People appreciate the benefits of central heating and electric lighting, but the rooms of a Colonial country home or a Georgian mansion -- which had neither -- continue to attract them, for they provide a measure of something that is absent from the modern interior. People turn to the past because they are looking for something that they do not find in the present -- comfort and well-being." Does appropriate nostalgia, nostalgia that is based on real concerns, mean we need to reject the technologies that have already been invented to lighten the domestic workload? Do we need to return to the Little House on the Prairie to find the comfort and well-being we crave? And could we tolerate the concomitant woodchopping, water hauling, and lye rendering? The answer for anyone except the most dedicated back-to-the-landers is probably no. More than 5,000 American families lined up to appear on the 2002 PBS series "Frontier House," which immersed its thoroughly modern participants in a careful semblance of the past's harsh realities. As viewers watched the series, though, the resolve of the experiment's "pioneers" wavered. The 1880s living environment was inspiring, but conditions were much more primitive than families had bargained for and way more difficult to adjust to. Somehow there's got to be a way of integrating the microwaves of today and the cornmeal mush of yesterday (actually, there is already, with microwave quick grits that take no more than five minutes, but the texture's lousy). We must discover how to progress without abandoning the richness of our domestic past. Historical reenactors forge one way of doing this. Women can adopt historic personas in muslin and stays at weekend Civil War conventions, say, then return to their DSL lines and desk jobs on Monday. This approach works for some. To travel back and forth in time wouldn't seem totally satisfactory for the majority of Americans, however, if only because it requires a dedication to the craft and hobby of reenacting on weekends that many people believe have already become full enough, what with watching their kids play softball, running errands or mowing the lawn, or squeezing in a round of golf if they are lucky. The idea of women's work, the domestic arts, the act of creating a safe and comfortable home environment, are concepts that today carry extreme intellectual and emotional freight. Now I find myself in a predicament strangely similar to my mother's, deciding what value to place on the work of my own home, how to integrate that work with the rest of my life and with my personal identity. I need to resolve which homemaking skills, knowledge, and attitudes to hand down to my school-aged daughter. At mid-life, I seem to be the only person who brings home-baked goods to meetings where everyone else relies on store-bought. Somewhat to my chagrin, I recently won the pie-baking contest in my hometown. Here is the paradox: as the organic tradition of homemaking declines, commercialized homemaking, homemaking as artifice, thrives mightily. The glue-gun craft explosion, the "Antiques Roadshow"-fueled antiques craze, the popularity of bread machines, Victoria magazine, Martha Stewart, the dominance of "country style" decorating all indicate there are some essential qualities of the home for which people hunger. The "voluntary simplicity" movement that originated in the early 1990s reflected Americans' concerns about overconsumption and overstress, suggesting the value of a way of life gone by. Pantries, the kind found in many a grandma's house, have once again become an integral part of new-home buyers' dream specs. Stores tout products reminiscent of a more home-oriented past: "nothing short of a spiritual guide" reads a holiday ad for a pot pie cookbook featured alongside Lincoln Logs and vintage martini shakers at Restoration Hardware. Other recent cookbooks have titles like Back to the Table: The Reunion of Food and Table, and Recipes from Home (whose recipes are based on dishes served at a popular Manhattan restaurant of the same name). Artificial, frozen, freeze-dried, and space-age foods are still multimillion-dollar businesses -- from Tang in the 1960s to microwavable "butter-flavor" popcorn in the 1990s -- but the hot trend is the return to old favorites. We're seeing a renaissance of such dishes as coleslaw, fried chicken, mashed potatoes, and spaghetti and meatballs. The fashion at restaurants and those home kitchens where cooking still takes place is firmly in the direction of regional cooking, authentic ingredients, and roots foods transformed into gourmet oddities, like a stone-ground grits soufflé with chanterelle and shiitake mushrooms. Some traditions remain rock-solid: the popularity of the three best-selling women's service magazines -- Better Homes and Gardens, Family Circle, and Ladies' Home Journal -- remains as strong as ever, with a combined circulation of 17.1 million, nearly twice the combined circulation of Time, Newsweek, and U.S. News & World Report. In the bruising magazine market there is even room for the launch of a new magazine devoted to the humble home arts. Real Simple astonished industry forecasters by selling double the projected circulation of its debut issue, which featured articles on homemade ice cream, laundry tips, and easier ways to clean the bathroom. The hipper-than-thou ReadyMade, a California-based shelter magazine launched in winter 2002 that takes an alternative approach, with articles on how to craft homey accoutrements from everyday objects -- a planter out of a shower curtain, a fruit bowl from a vinyl LP, and a meat-cart bed -- demonstrates the appeal of domesticity refashioned for the dot-com generation. Is the return to the home nothing but escapism? Should we celebrate the heroic farm wife who is now virtually extinct? Can we be glad that we have progressed to a mechanized age in which we reap the rewards of the traditional with a dwindling investment in homemaking? There is a double bind that many of us endure but feel unable to resolve in a meaningful way: the tension between our public and private lives. We know deep within ourselves that home and hearth are important, but we feel guilty about acting (or not acting) on that knowledge. A stressed-out mother with a demanding job in commercial illustration told me recently with obvious relief that "we don't have to do it all because Martha will do it for us." People seem eager to relocate the hearth to someplace other than the heart of the home. The television is often described as the contemporary hearth, or the computer, or the workplace. In fact, the hearth can mean anything we feel strongly about. The dancer Maya Plisetskaya, for example, one of the greatest ballerinas of the last century, has described her entrance onto the Bolshoi stage: "I awaited my music, my cue with a shiver of joy, a feeling of incomparable happiness spreading throughout my body. Three more bars. Two more. One more. There. My music. I step out onto my stage. It was a familiar creature, a relative, an intimate partner. I spoke to it, thanked it. Every board, every crack I had mastered and danced on. The stage of the Bolshoi made me feel protected; it was a domestic hearth." If there is no actual hearth on which to base these metaphors, though, I don't know that we can survive. Successive iterations weaken the analogy: if everything can be a hearth, then nothing is. Restoring respect for the home and its labors is something of a high-wire act, since to praise the homemaker is, for many people, to criticize the career woman. I suspect, though, that the successes of feminism are secure enough that we can begin to enlarge its scope. We have come far enough along the path of change to be able to stop and take stock, and perhaps retrieve a thing of great value that we have nearly left behind. As a feminist, I have no interest in downgrading the accomplishments of women in the worlds of law, science, sport, politics, or literature. In our rush to celebrate pioneers who have broken into worlds long regarded as male turf, however, we have overlooked a rich sphere of human endeavor. The only way forward is for us as a society to relearn to value work in the home without falling into reactionary traps about "proper" roles for women and men. A new paradigm must rise out of a culture in total transformation, through the prevalence of divorce, two-career families, and a consumer culture dominated by powerful corporations. It's time for a reevaluation of the modern cultural landscape, the monotonous world of strip malls and chain restaurants. In the deracinated America of today it would seem there is, literally, no place like home. We know something is lacking. We see the domestic void in myriad ways all around us, but we don't recognize what we could do to halt the destruction and hold on to traditions, make domesticity intrinsic to our lives rather than peripheral or fetishized or commodified. Can we establish what elements of homemaking people miss and desire? Can we determine ways we can hold on to these elements without finding ourselves mired once again in 1950s Pleasantville, with all the color leeched out of our lives? Searching for a revitalized sense of home shouldn't be undertaken because it's good for you, the way it's good for you to eat your broccoli. We owe it to ourselves to live our lives fully, to reap the pleasures that present themselves to us as humans. Washing the kitchen windows might not readily appear to offer psychic fulfillment, but perhaps this is because we have forgotten what it means to live as agents of our own environment. We've given away much of the power over how we live in our most intimate daily life. We've come to believe that minding the hearth is a role of lesser value, and in part this is simply because any embodiment of that power has grown remote, unknown to most of us. We don't learn in school about any primordial strength in homemaking, starting with the domestic phenomenon that made civilization itself possible...Hestia's fire. Jean Zimmerman is the author of the debut novel The Orphanmaster. Jean has also published nonfiction focusing on the changing role of women in America: Love, Fiercely: A Gilded Age Romance; The Women of the House: How a Colonial She-Merchant Built a Mansion, a Fortune and a Dynasty; and Tailspin: Women at War in the Wake of Tailhook. Jean is the coauthor of Breaking with Tradition: Women and Work, the New Facts of Life and she and her husband, Gil Reavill, published Raising Our Athletic Daughters: How Sports Can Build Self-Esteem and Save Girls' Lives. Zimmerman lives with her family in Westchester County, New York.